There are some abstract games that implement a modicum of theme just to deliver justification for the gameplay. Even Chess historically derives its play from medieval armies lined up for war, but has generally been accepted as more abstract than thematic. Creating a game that injects enough theme into abstract play definitely has challenges, and Tyler Sigman and David Gerrard are the guys to accept that challenge. 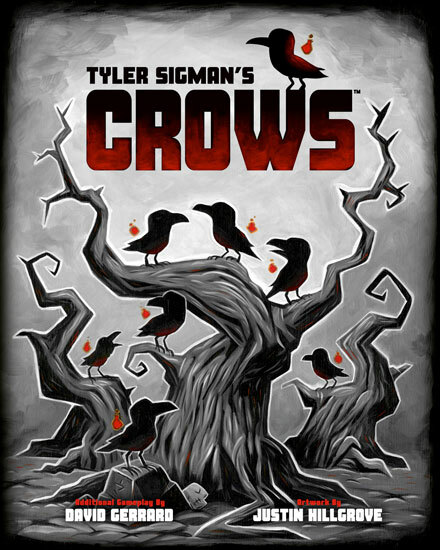 Crows, having debuted in 2010, is getting a makeover with new rules by David Gerrard and a new release ready for Kickstarter. Crows is an abstract, token manipulation game for 2-4 players that takes about 45 minutes to play. It plays best with 3 or 4 players. Although not completely explained, the players in Crows appear to be ancient wizards summoning and manipulating flocks of crows to attract them to their mana totems. The player who manages to attract the most crows will eventually win the game. 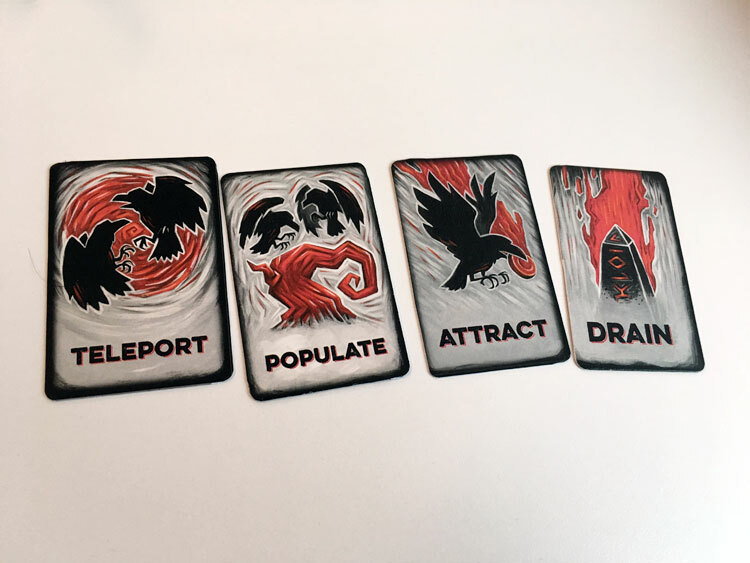 Spells manipulate the locations of crows across the tiles. This attraction is accomplished by playing tiles to a grid pre-seeded with a lattice of random tiles. Every turn, a player will draw a tile to their hand, then play one of the two tiles they hold. If there are any crows on the tile, they add new crow tokens to the board. Then the player will place an obelisk shaped mana totem. If they place their totem on a barrens tile, they get to draw a spell card. 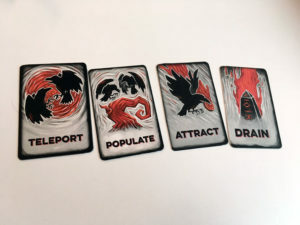 At the end of their turn, a player may then play a spell to move crows across tiles in various ways, depending on the spell. 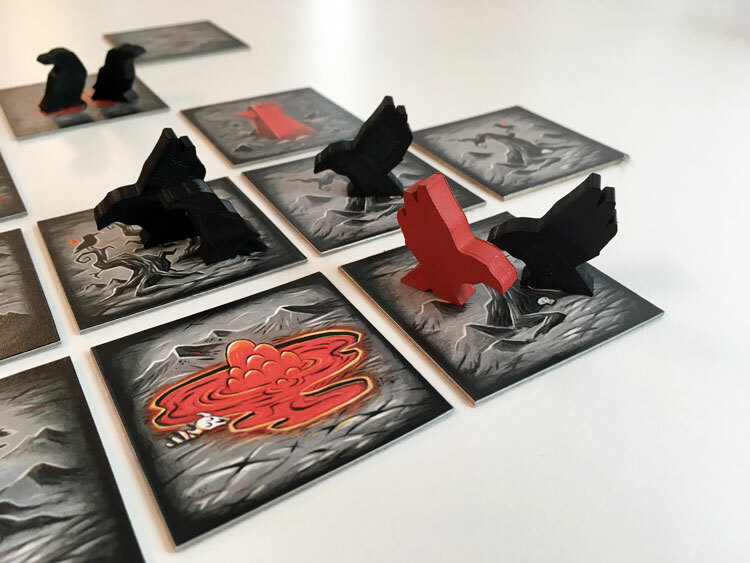 Once all players have placed their tiles and totems, the crows flock. Crows that are either horizontally or vertically aligned with a totem will move towards the closest totem. Different types of tiles will break ties for crows who are equidistant to two or more totems. 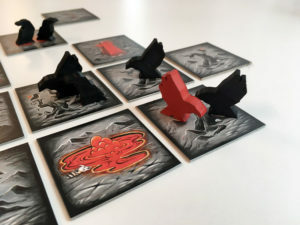 Once the proper crows have been moved, for each crow, the player collects one or more point tokens. One of the coolest mechanisms comes into play when six or more crows have landed on the same tile. The tile receives a mana corruption token and the crows scatter. This scatter pattern radiates outward in a spiral with each crow moving to a different tile. This causes the board to even out with crow tokens to prevent players from continuously hoarding points. The game comes to a close when the Nightfall token is drawn. Players count up their points at the end of the round to determine the master of Crows. Players will need to place their Mana Totems carefully to block other players while also attracting crows. Games which tell stories are always fun. The art and design by the distinguished Justin Hillgrove for this second edition of Crows is exceedingly well done, with a darkness and a palette to match the game’s comic evil flair. The characters on the player’s reference cards are cute and malevolent, just like the rest of the design. It pretty much feels like Beetlejuice designed a board game. The Queen Crow (red) is worth 3 points to the attracting player. The components are also strong which aids the theme. The original version of the game was a bit small, with plastic gems to attract crows. However, this new version has more crow shapes. The mana totems stand out nicely against the black and white landscape. The whole setup definitely attracts attention sitting on the table. The gameplay is also fairly fast and calculating. It’s not always best for players to take the move which gives the most crows if it sets them up for a weak turn afterwards. Also, acquiring spells is of noticeable importance because it delivers the flexibility in choice which players will need to offset the random tile draws. 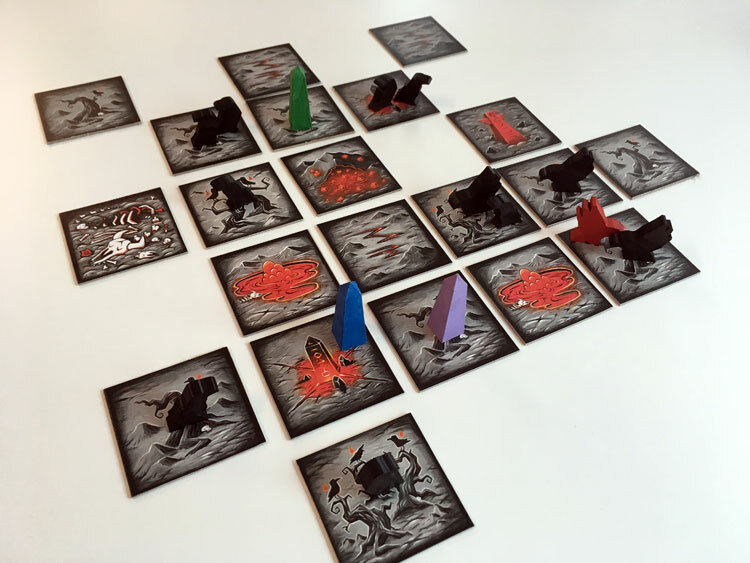 For the most part, Crows is a light, fun abstract game that’s a perfect filler to open or close game night. The rules are straightforward but the play demands just enough mental hoop jumping to keep thinky types engaged. With more players, the difficulty ramps up and competition is fierce. The redesign of Crows is a surprising and welcome design. It has a beautiful feel, much like a more thematic game but has strong enough abstract game mechanisms. There’s plenty to master, especially with more than 2 players. It’s a great game for teaching basic strategy, especially with kids. Gamers in the market for a light fun abstract strategy game should flock to the Kickstarter page.